Dramatic gothic eye makeup tips can get you beyond the thick swipe of dark shadow on the lids or a ring of black liner. There's a gothic cat eye, for example, that you can add to and play around with until it truly demonstrates your style and artistic capabilities. Gothic eye makeup can be as simple or elaborate as you want to make it, so don't be afraid to kick it up a notch. When it comes to achieving gothic eyes, the key is to go dramatic. It's not about using as much black eyeliner and mascara as possible, nor is it about piling everything on in a haphazard fashion. Drama is best achieved with a singular goal in mind. If you love the look of rich, thick eyeliner, use that as your focal point and play it up as much as possible. If you're more of an eye shadow girl, use this opportunity to play with a little bit of color and bring something unexpected to a typical look. Pay your brows some extra attention for a truly dramatic eye look. High arches are key to achieving something that really turns heads. Once you've plucked those brows into shape (perhaps using a shaping kit, such as one from Anastasia), you'll want to fill them in with a dark brown or midnight black brow pencil. Don't be shy or light-handed about it; the key is to create intriguing, shaped brows. Use liquid liner to draw sharp, precise lines, which can either stop at the outer corners of the eye or extend past it for heightened drama. Goths typically line both upper and lower lids. Practice care when lining the lower lids and avoid getting liquid liner into your eyes. Apply the darkest mascara you can find in one to two coats. You may have been wowed by the glamorous cat's eye makeup seen on red carpets over the years. The gothic take on this look, though, is slightly more deconstructed and unfinished. Achieve it by first applying eye shadow base to your eyelids. Then, coat the entire lid with a pale eye shadow. Shades such as cream, baby pink, ivory or white are common choices, but let your selection reflect your mood. Use a liquid liner with a firm tip to trace your crease, flicking the line up and out at the outer edge. Draw a line from the outer edge of the upper lash line up toward the tip of your brow (don't go all the way up, but almost), joining the end of that line with the end of the line in your crease. Fill in the resulting shape with your liquid liner. It will cover your whole lid. Extend the line down at the inner corner to really accentuate the cat-eye shape. Next, select a dark shadow shade, such as black, deep navy, smoky gray or eggplant. Pat that on top of the liner, careful to avoid softening the edges. This will help set the liquid liner. Use a kohl, gel, or pencil liner in black on the waterline and smudged out below the lower lash line, all the way across. You can also set this with the dark shadow. Apply mascara and fill in your brows if needed. This trick works no matter what type of look you're going for, but it's especially effective when the rest of the makeup is dark. Apply a silvery-white shade to the inner corner of the eye and line the lower inner lid with a stark white pencil. This will open up the eye area tremendously and allow that dark eye shadow to really stand out. It's not all dark and matte where gothic makeup is concerned. You can add a little sparkle with glitter shadows -- in colors like silver or icy blue -- placed right under your brows or at the inner corners of your eyes. This will soften your look, as well as brighten the eye area. Still, this is gothic makeup, so avoid allover shimmer and opt for artful placement for maximum impact. You can also experiment with darker shadows that contain iridescent specks that sparkle in a subtle way with every turn of your head. Black will always be a goth's go-to color, but you'll find plenty of other deep shades that work well with your pale skin and mysterious nature. Try shadows in burgundy, deep emerald green, indigo, violet and even red. Apply to your upper lids in several coats until the color is the deep, rich shade you want and blend well. What goth girl would be caught out without black eyeliner and mascara? You can instantly create all the drama and mystique of gothic makeup with black and charcoal eye colors. 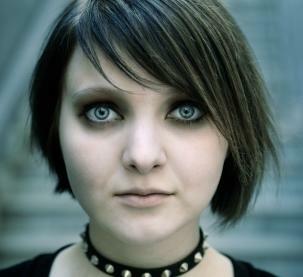 Goths aren't subtle about application, either, so forget about creating a "natural" look. Look for the darkest blacks you can find when it comes to eye products, such as Maybelline's Great Lash Mascara in Blackest Black (even darker than Very Black), MAC eye shadow in Carbon and Nars' Eyeliner Stylo in Shiny Black. You may be contemplating using your eyeliner as a paintbrush of sorts and using your eye area as the canvas. All kinds of designs - spider webs, batwings and the like - are commonly spotted on Halloween. However, gothic looks aren't costumes for those who favor that style, so it's imperative to exercise caution if you're trying to stand out in a crowd. Chances are that a poorly or lazily depicted drawing near the eyes will not make your eyes stand out the way you imagined. Instead, utilize other types of embellishments, such as finely milled glitter over the lids, bright eye shadows to accent the overall look (acid yellow and vibrant fuchsia are common choices) and false eyelashes spiked with silver or gold tips.